An offering of ever-changing classes and entertainment designed to keep your mind challenged, your creative juices flowing, and your body active. With affordable real estate, a walkable business district, and easy access to downtown Pittsburgh; Bellevue is a great place to call home. Come have a drink, check out a show, or visit an art gallery after hours! Our charming community is populated with authentic people, nostalgic history, urban vibrancy, small town comforts, convenient day-to-day amenities, and diverse places of worship. On behalf of our group of engaged citizens invested in bringing growth, business, and beauty to our borough, we invite you to come live, worship, and shop in Bona Fide Bellevue. Letters have been mailed to 729 eligible property owners for the Historic Plaque Program. Plaques can still be ordered. Learn more about the program, view a list of eligible properties, or process your order/purchase. An offering of ever-changing classes and entertainment designed to keep your mind challenged, your creative juices flowing, and your body active. View details of current classes and register to participate now on our Events page. 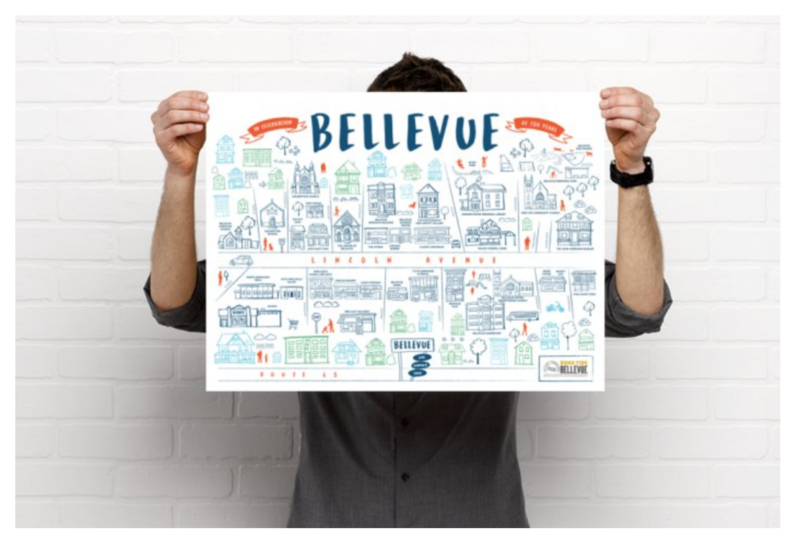 Available now – the custom 150th anniversary hand-drawn map illustration of Bellevue. Prints are available as poster prints, mounted for easy hanging, or matted and framed in a selection of styles. All proceeds go to the Bellevue Initiative for Growth and Revitalization to support efforts to improve and beautify Bellevue. Get one now! Bellevue about to get its second bar and a brewery. WQED’s Anna Singer interviews Samuel Bozzolla about his mother, former Met Opera star and longtime Bellevue Resident Claudia Pinza.